Good morning, Friends! 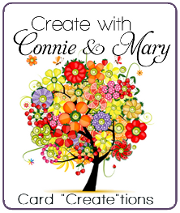 We have come to the end of our first week of Card "Create"tions at Create with Connie and Mary! What amazing cards and ideas! I am so excited to see what week 2 has in store! And if you are not a subscriber, you still have time to sign up! Don't wait! There are great ideas ready for you to use! And by signing up you get the downloadable tutorials to help your card making be as simple as possible! At the end of each week of the special edition, each of the designers share a little "favor" or 3-D item using the stamp set that they used for the edition. 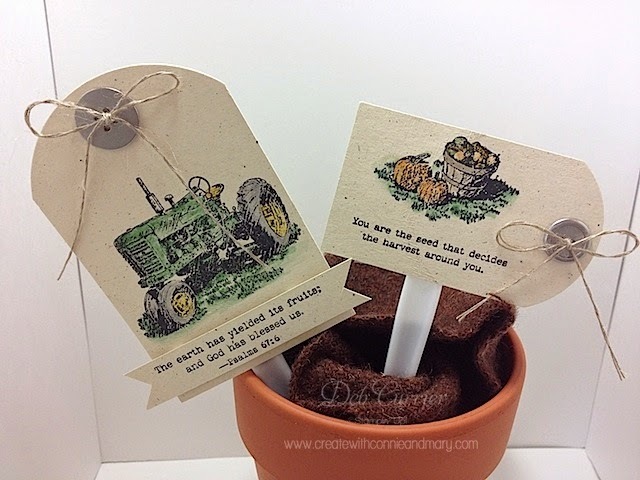 This week I used the Harvest of Blessings stamp set. I had a lot of fun with this set! I don't own this set and had to borrow it from my friend Becky (thanks, Becky). So the only way to see any of the cards that I have made using this set is to be a subscriber! For my favor today I am sharing an idea that I got from the current Stampin' Up! catalog. These are a sort of plant poke. It's still a little early to be planting vegetables and things but I was thinking how cute they would be at a Farmer's Market stuck in a basket of vegetables! Or as a gift to someone who is an avid gardener! To make these is a super simple process! Cut a piece of Naturals Ivory at 4 1/4" x 2 3/4" and a piece at 2" x 3 1/2"
Super cute, Deb! Love these for the avid gardener! What a great idea!! I love these plant pokes, perfect for this time of year!! These picks are adorable Deb. My hubby would love the John Deere green!